With Jo in Mexico for the week I had plans to catch a lot of live music this weekend. It didn't turn out exactly like that but landscaping projects overruled music several nights. My original plan on Friday was to see the Band of Heathens at Antone's but during my drive back to the ATX I heard about a free show at Republic Square Park sponsored by Car2Go. Car2Go is a company that has smart cars all around town and if you are a member you just swipe your card and drive off in the vehicle for as long as you need it. Pretty cool idea for city dwellers who use public transit for normal transportation. Just not sure it will catch on in Texas! As part of this event there were 5 bands playing starting at 4 PM. 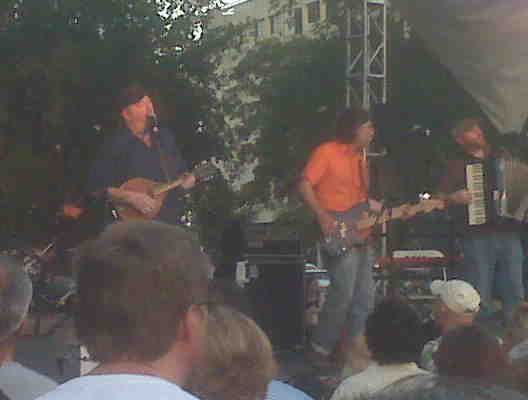 Considering it was a 90+ degree day I decided to catch the later acts and arrived at 7 PM just as the Gourds were taking the stage. I have been wanting to see these guys for a couple of years ever since their CD "Noble Creatures" came out. I really like the song "How will you shine?" and recently I heard Mr. Springsteen say when he was dj'ing on E Street Radio "Man, I wish I wrote that". Pretty good recommendation in my mind. Anyway they are 4 guys who look nothing like a rock and roll band. More like some mechanics but they put on a fun show. They are high energy in a funky NOLA kind of way and closed with Shine - overall it was a good hour long set. 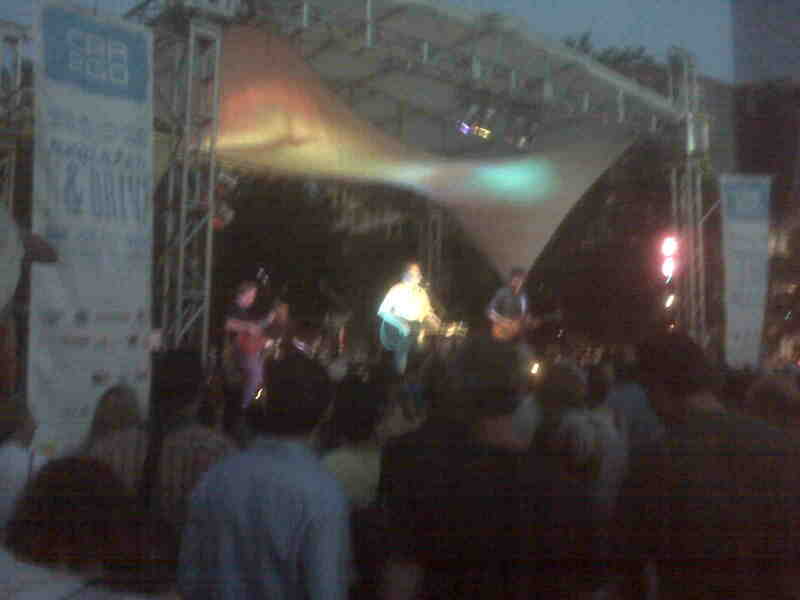 And I know the pictures are crappy but all I had was my Blackberry so they have to do. The headliner for the night was Joe Ely. I had never seen Joe with his band, only with Bruce twice at Austin shows where he was called up to sing "Working on the Highway" along with "All just to get to you". We'd hear neither of these this night but a lot of other great songs. I had to look it up when I got home but Joe is 63 and still puts on a heck of a show. It started out a little slow for my liking but of course I was there by myself. Things picked up when he played Robert Earl Keen's "The Road Goes On Forever" which is always a hit in Austin. From there he really featured the excellent guitar playing of David Grissom who is one fine player. He had a lot of solos and each one seemed to get better. Highlights for me were "Workin' for the Man", "Me and Billy the Kid", "Dallas" and "Cool Rockin' Loretta" to close. I will have to say that "Loretta" in the final spot is the way a rock and roll show is supposed to finish - long version, lots of guitar, crowd sing along and everybody just having a good time. Joe is constantly on the road so make sure you catch him when you get a chance. I know we'll be out to see him again. A great way to spend a Friday night that's for sure. My Saturday night plan to see Jimmy LaFave at Threadgill's and Sunday night to see Junior Brown at the Continental Club was scuttled by some shrub removal and flower bed building. I will see Junior soon on the advice of my friend Christopher but it was not to be this weekend. Up next - maybe Alejandro at the Continental Club Tuesday night, if not Big Head Todd at Red Rocks in Denver in 10 days and then Neil Young solo acoustic in Dallas on the 7th. Neil was my target for 2010 so I am really looking forward to that show.